Figure 1. Two views of the microwave furnace used for this project. Figure 2. A profile of preheating, sintering and cooling of samples. Figure 3. Concentration of nickel in X+ and X- directions according to distance. Although microwave sintering of ceramics began more than 40 years and has developed widely, the technology's use in processing powder metal parts is a relatively recent development that has reached commercial application only in the past few years. Microwave heating and sintering is fundamentally different from conventional sintering. Microwave heating involves conversion of electromagnetic energy into thermal energy. The advantages of this mechanism are rapid and highly efficient heating. This saves both time and energy and high temperatures can be achieved with relatively low microwave application temperature ,  and . However, some materials to be processed do not absorb microwave energy very well at low temperature. To overcome this problem, it is possible to use furnace furniture which absorbs microwave energy very well at low temperature. In this way the temperature of the furnace furniture is first increased, and then the temperature of inside sample will be increased and, having achieved high temperature, the sample absorbs microwave energy with more efficiency  and . However, powder metallurgically produced parts present different characteristics: some PM parts do not reflect any wave in the microwave system while other parts intensively reflect microwave . Much research has focused on microwave sintering of ceramics.Physical, mechanical, electrical and thermal properties, as well as the microstructures of many types of sintered ceramicsand hardmetals have been studied by microwave energy . In recent years, some researchers studied microwave sintering of metal powder parts. Bronze alloy was sintered by microwave and the diffusion of Sn in Cu was studied . 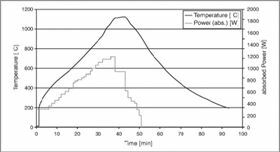 In another study, MOR of Fe-Cu alloy sintered by microwave was compared with the same alloy sintered by conventional heating method . However, in this research, effect of microwave on the diffusion of nickel in iron was studied and properties of microwave sintered ferrous PM parts with conventional sintered PM parts were compared. In this research a microwave furnace was used as the source of energy for sintering. It was capable of 2.45 GHz frequencies at 6KW power and was supplied by Bayreuth University in Germany. It is shown in Figure 1. The powder in this research was WPL-200 atomised iron powder which was a product of Iran Powder Metallurgy Complex (IPMC). The nickel powder used was a carbonyl powder with a size of about 15μm and 99.99% purity. The micro wax powder used as a lubricant was supplied by the Clariant Company. The procedure was begun by mixing WPL-200 powder, micro wax and 1.75% carbonyl nickel powder. The mixed powder was compacted to cylindrical samples shape with a laboratory press to reach 6.8 ± 0.05 g/cm3 green density. The atmosphere consisted of a 95N2/5H2 mixture at an ambient pressure of 1 bar and the flow rate was set to 2 l/min. For temperature measurements by pyrometer, the emissivity was set to 80% and the displayed temperature was additionally corrected by the observation of the melting points of silver (961.9°C) and copper (1083°C). The profile of preheating, sintering, and cooling of samples is shown in Figure 2. The sintered samples were then polished and analysed by a scanning electron microscope (SEM). The diffusion profile of nickel in iron was measured in two perpendicular directions in cross sections of samples using an electron microprobe with an accelerating voltage of 15 KV and current beam of 20nA. The diffusion coefficients were derived assuming diffusion in a semi-infinite medium, so the diffusion coefficients were governed by Fick's second law. The results show that diffusion coefficient in tow direction is quite different. 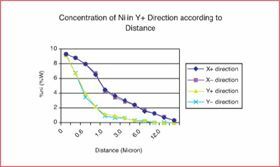 Diffusion coefficient in the X direction is almost equal to that reported for nickel in iron by Righter et al . However, in the Y direction, it is about 1000 time less than in the X direction. The reason comes from the fact that microwave rays in microwave furnaces are not equal in both directions. The concentration of nickel in X+, X—, Y+ and Y— directions were shown in Figure 3. Although the iron lattice has a cubic structure and diffusion should have demonstrated symmetric behaviour, sintering in microwave conditions show an unsymmetrical behaviour from the diffusion coefficient point of view. 1 J Cheng et al., “Continuous Microwave Sintering of Alumina Abrasive Grits”, Journal of materials processing technology 108 (2000), pp. 26–29. 2 I Nan Lin et al., “On the microwave sintering technology for improving the properties of semi conducting electronic ceramics”, journal of European ceramic society 21 (2001), pp. 2085–2088. 3 M Penneerselvam, A Agrawal and KJ Rao, “Microwave sintering of MoSi2-SiC composites”, Materials Science & Engineering A 356 (2003), pp. 267–273. 4 Chien-Yih Tsay, Kuo-Shung Liu and I Nan Lin, “Co-firing process using conventional and microwave sintering technologies for MnZn – NiZn ferrites”, Journal of European CeramicSociety 21 (2001), pp. 1937–1940. 5 M Mizuno et al., “Sintering of alumina by 2.45 GHz Microwave Heating”, Journal of European CeramicSociety 24 (2004), pp. 387–391. 6 E Breval, “Comparison between microwave and conventional sintering of WC/Co composites”, Materials Science & Engineering A 391 (2005), pp. 285–295. 7 M Willert-Porada, H.S. Park; “Heating and sintering of steel powders with microwaves at 2.45 GHz frequency – related between heating behavior and electrical conductivity; Microwave Theory and Application in Materials Processing, Second world congress on microwave and radio frequency processing, April 2000, Orlando, Florida, pp. 459–470. 8 A Upadhyaya, G Sethi and D Agrawal; “Microwave Sintering of Cu-12Sn Alloy”;. 9 K Righter, A J Campbell, M Humayun; “Diffusion of trace elements in FeNi metal: application to zoned metal grains in chonrites”, Geochimica et Cosmochimica Acta, June 2004. 10 Paul Shewman, “Diffusion in solids”, Second ed. Warrendale Pennsylvania, 1989. This article was drawn from Diffusion rate of nickel in iron during microwave sintering of PM parts, a paper by Nadjafi Maryam Negari, R Sarraf-Mamoory and N Riahi-Noori who work in research for Iran's powder metallurgy industry.